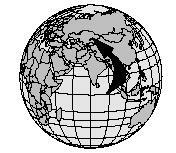 Kazakhstan is located in southern Asia between Russia and Uzbekistan. Approximately 80 percent of the land consist of lowlands, plains, and plateaus. Strong winds often sweep through these flat lands. The country is about the size of two Alaskas—around one million square miles. However, its population is only about 17 million, less than New York City. The climate in Kazakhstan is varied, and different plants and animals are found according to region. Parts of Kazakhstan become extremely cold in the winter and very hot during the summer. The Kara Kum Desert, the world's fourth largest desert, occupies most of central Kazakhstan. 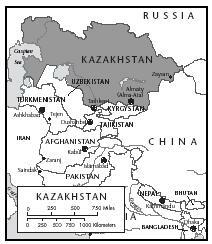 Kazakhs constitute 46 percent of the population and Russians, 35 percent. The remaining population consists of Ukrainians, Germans, Uzbeks, Tatar, and other groups. For hundreds of years, Kazakhs were herders who raised qazaqi qoy (fat-tailed sheep), cattle, ayïr tüye (Bactrian camels), and at (horses). Kazakh nomads heavily relied on their animals for transportation, clothing, and food. They usually ate mutton (sheep), milk, cheese, and flat bread baked on a griddle. Kazakh nomads migrated from region to region, depending on available water and pastures for their livestock. They also produced goods that they traded for grain, vegetables, and fruits at markets in the more settled cities of south Kazakhstan. Cone-shaped tents called yurts were their homes, which were easy to set up, dismantle, and carry. Union in 1922, and Kazakh nomads began to settle in rural villages or cities. There are, however, some Kazakhs who still live the nomadic way of life, moving with their yurts and herds to summer pastures every year. The Silk Road was a major trade and travel route that ran through present-day Kazakhstan between Asia, the Middle East, and Europe in ancient times. Present-day Kazakh cuisine includes some Uzbek, Russian, and Korean foods mainly found in cities. Traditional Kazakh foods reflect the nomadic peoples and also Middle Eastern influences. Horsemeat and mutton are the most common foods. Middle Eastern methods of preparing and seasoning rice, vegetables, kebabs (skewered meat), and yogurt have been added. Although Kazakh cuisine has some Russian influence (and viceversa), the Russian people living in Kazakhstan have generally retained their native culture and cuisine. A traditional Russian meal includes meat, potatoes, dumplings, and vegetables. Cold dishes called zakuski (smoked fish, pickles, or onions) may be served first. Borscht (beet soup) may be eaten next, followed by meat or fish with bread. Favorite drinks such as black tea and vodka are part of Kazakh and Russian custom. Russian food is found in abundance in northern Kazakhstan and larger cities. Based on nomadic roots, horse meat and mutton (meat from sheep) are the basis of a majority of Kazakh dishes. Dishes include shuzhuk (a type of sausage made from smoked horse meat), and kuyrdak . Kuyrdak (also spelled kuirdak) is prepared from a freshly slaughtered horse, sheep, or cow, and consists of the animal's heart, liver, kidneys, and other organs. They are cut into pieces, boiled in oil, and served with onion and pepper. Basturma is mutton eaten with fresh cucumbers and tomatoes. Round, flat loaves of bread accompany most meals. Pour the vinegar over the lamb in a large mixing bowl. Add the onions and cover with plastic wrap. In a frying pan, heat oil over medium heat and add lamb mixture. Brown both sides of the lamb, then cover. Serve with sliced tomatoes and cucumbers. Beshbarmak , a traditional dish of meat (such as mutton) is eaten with boiled dough. The dough is rolled into thin strips and cooked in mutton broth. It is served with mutton over the top and flavored with garlic and onions. Qazy is smoked horsemeat sausage, sometimes served sliced over cold noodles. Native fruits are grown in mewäzar bagh (orchards) and include orik (apricots), shäftali (peaches), qawun (melons), apples, and uzum (grapes). Plov (rice pilaf) is a side dish usually made with rice, dried apricots, dates, prunes, or Kazakh apples. 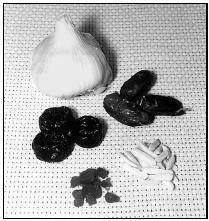 Garlic, dates, almonds, apricots, and prunes (clockwise from top) are added to rice and ground meat (usually lamb) to make plov, or Kazakh rice pilaf. Brown the lamb mixture until lamb is no longer pink. In a serving bowl, combine the lamb with oil and rice then mix. Place the cut lamb into a large pot. Add enough cold water to cover. Bring to a boil, then reduce heat to low. Cook for about 1 hour. In a skillet, heat the oil over medium heat. Sauté carrots, onion, and bay leaves about 10 minutes. In a large bowl, mix the cooked noodles, onion, bay leaves, and carrots. Remove and discard bay leaves before serving. Top with boiled lamb and dill. Because the early nomads heavily depended on livestock for survival, animals were at the core of ancient Kazakh religion. Traditional beliefs held that separate spirits inhabited animals. Honored guests were sometimes asked to bless an animal and ask its spirit for permission to taste its flesh. Most Kazakhs of the twenty-first century are Sunni Muslims. The Islam religion did not become widely practiced until the late 1700s. This is because the nomads of that time settled in rural areas, and the Muslims worshiped in mosques that were in the cities. Muslims in Kazakhstan celebrate the Festival of Fast-Breaking (known as Id al-Fitr or Eid al-Fitr elsewhere), which is the day ending Ramadan. Ramadan is a month-long fast, where Muslims cannot eat or drink from sunrise to sunset. During the Festival of Fast-Breaking, Kazakh Muslims visit each other and hand out deep-fried dough twists and other fried doughnuts, such as baursaki , as a form of celebration. Combine all ingredients into a large mixing bowl to form dough. Knead the dough on a floured surface, then return to mixing bowl. Cover with a towel and let sit for 30 minutes. Heat oil in deep skillet over high heat. Pull off Tablespoon-size pieces of the dough and roll into a ball. Press down slightly, then drop carefully into oil and fry until golden brown. 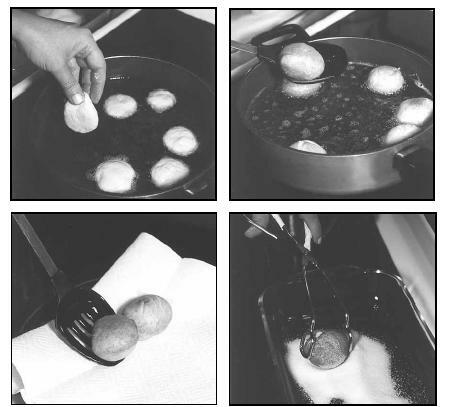 Drop balls of dough into hot oil. Then sprinkle the finished baursaki with sugar. Nomadic women prepare bread to be baked on a griddle over an open fire. Day is celebrated much like Christmas in the United States. People decorate trees in their homes, exchange gifts, and gather with family and friends to sing and eat together. Hospitality is an important part of Kazakh culture. A Kazakh host will feel offended if a guest does not have some refreshments, or at least a cup of tea. Refreshments might include dried and fresh fruits (grapes or melon), nuts, cakes, or baursaks (a type of bread). They also may be offered some fermented kymyz (milk from a female horse) to drink. Tea and kymyz are served in a piala (Asian teacup) or a wooden bowl. A guest is usually offered a place of honor at the table. If invited to a person's yurt (tent-like dwelling), diners step outside to wash their hands before a meal. A prayer is said and the guest is served first. Eating is usually done with the right hand, or a knife and fork. Tea is usually served after dinner. Once the adults have eaten, children eat the leftovers. A unique custom in Kazakhstan is the dastarkhan , a feast for visiting guests and special occasions that includes meat dishes and dairy products. Appetizers may be smoked or boiled meat, zhuta (pasta stuffed with pumpkin or carrot), and flat cakes. Vegetables, sorpa (rich broth), and shubat (a milk drink) may be offered next. For the feast, an entire animal, usually a sheep, is slaughtered and the oldest member of the family carves the head and serves the family. This is considered an honor in Kazakhstan. Besbarmak is the animal's meat, boiled, and served on a platter with dough that has been boiled in broth. Different parts of the animal symbolize traits desired by those eating them. For example, children are often served the ears as a symbol to listen better. The person who receives the eye should seek wisdom, and a tongue means that a person should be more expressive. 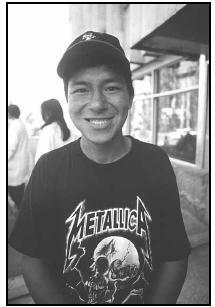 This Kazakh teenager enjoys the same rock music as his counterparts the world over—but the milk he drinks is more likely to be from a sheep or goat than from a cow. Place meat in a large pot and fill with enough cold water to cover. Add remaining ingredients except cooked rice. Bring to a boil and cook, about 45 minutes. Add rice and cook 5 additional minutes. Kazakhstan was the site of the former Soviet Union's nuclear testing programs, and areas of the country have been exposed to high levels of nuclear radiation. This exposure has weakened the health of many Kazakh residents. These people generally have weak immune systems, which is passed down to their children. A significant percentage of children under the age of five suffer from anemia (insufficient iron in the blood). Some researchers have estimated it will take 50 years for these conditions (weak immune systems and anemia) to reverse, which may be accomplished by the unhealthy people marrying those who are healthy. 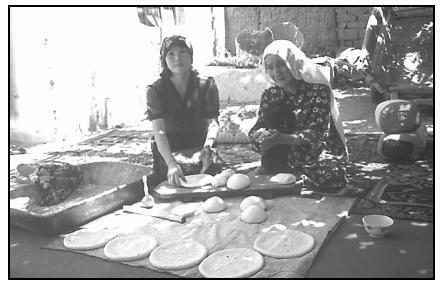 Because of the sparse (for its area) population, most Kazakhs have adequate food and do not have a problem with nutrition. Almost half of the population is employed in agriculture. Crops such as wheat, barley, beets, melon, grapes, and apples are grown. Kazakhstan's natural pastures provide good feeding for sheep, horses, cattle, and goats. Bradley, Catherine. Kazakhstan . Brookfield, CT: Millbrook Press, 1992. Central Asia . Hawthorn, Victoria, Australia; Oakland, CA: Lonely Planet Publications, 2000. Gateway to Kazakhstan. [Online] Available http://www.kazakhstan-gateway.org/cultureandart/nationalcuisine.htm (accessed April 24, 2001). Geocities.com. [Online] Available http://www.geocities.com/kazakhstan_adopt/informational.html#cook (accessed April 24, 2001). Kazakhstan National Cooking. [Online] Available http://www.kz/Firsteng3.htm (accessed August 16, 2001). Lonelyplanet.com. [Online] Available http://www.lonelyplanet.com/destinations/central_asia/kazakstan/printable.htm#culture (accessed April 24, 2001).